Third year B. Pharmacy students visited “ Life vision Healthcare pvt. Ltd.” and “SAAR Biotech pvt.Ltd.” Baddi (HP) on March 2018. It was a good practical exposure for students. Third year B.Pharmacy students visited “Life Vision Healthcare pvt. Ltd.”, Baddi (HP). 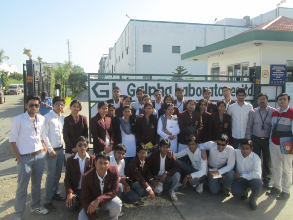 Third year B.Pharmacy students visited “SAAR Biotech pvt.Ltd.” Baddi (HP). Third year B. Pharmacy students visited “ Alkem Laboratories” and “Helios Pharmaceutical” Baddi (HP) on 21 & 22 March 2016. It was indeed a good practical learning experience. Third year B.Pharmacy students visited “Alkem Laboratories Pharmaceutical Ltd”, Baddi (HP). Third year B.Pharmacy students visited “Helios Pharmaceutical” Baddi (HP). Third year B.Pharmacy students visited “Helios Pharmaceutical” and “Macleods Pharmaceutical Ltd”, Baddi (HP) on 2 & 3 April, 2015. It was indeed a good practical learning experience. Third year B.Pharmacy students visited “Macleods Pharmaceutical Ltd”, Baddi (HP). Third year B.Pharmacy students visited “Helios Pharmaceuticals Ltd & GL Galpha Laboratories Ltd.”, Baddi (HP) on 22 & 23 April, 2014. During their visit students got familiar with commercial production of medicine. It was indeed a good practical learning experience. Third year student’s visited Helios Pharmaceuticals at Baddi (HP). Third year B.Pharmacy students visited “Quixotic Healthcare” and “Macleods Pharmaceutical Ltd”, Baddi (HP) on 20 & 21 March, 2013. It was indeed a good practical learning experience. Students visit to Quixotic Healthcare at Baddi (HP) in March, 2013.